Dog Heroes of September 11th - A Tribute to America's Search and Rescue Dogs, now in its Tenth Anniversary second edition, is the first and only major publication to salute the canines that served our nation in the recovery missions following the terrorists' strikes on America. In his foreword to this edition, former New York City mayor Rudolph Giuliani says, "No American could be unmoved by the stories and images of these dogs and their handlers....Their journeys, as told in these pages, reinforce our resolve to persevere, rebuild and keep our nation safe and strong." A testament to man's best friend and his most critical role in American history, Dog Heroes of September 11th pays tribute to 79 canine heroes and their handlers, retelling their heart-stirring stories and photographically capturing many defining moments of the days that followed September 11, 2001. This oversized gift book features over 400 color photographs, many never seen except in this publication. Nona Kilgore Bauer, who has won multiple awards for her books on dogs, interviewed each of the handlers who participated in the recovery efforts at the World Trade Center, the Pentagon, Shanksville, Penn., and the Fresh Kills landfill, the site to which remains from the fallen towers were transported, and lovingly retells their stories of heroism and bravery. 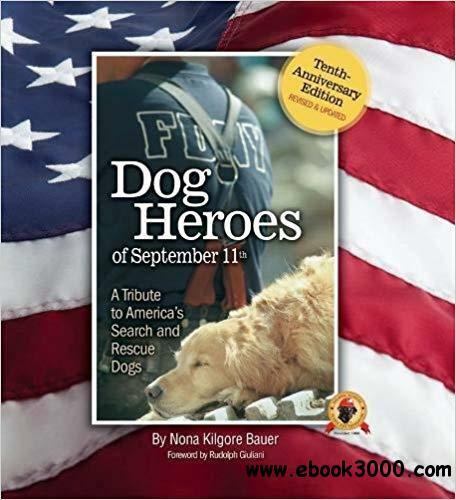 In its first edition (released in 2006), Dog Heroes of September 11th won numerous awards, including book of the year from the Dog Writers Association of America, Book-of-the-Month Club, and the Independent Book Publishers Association. The second edition, expanded with over 100 new pages and over 150 new full-color photographs, presents chapters on military working dogs in Iraq and Afghanistan, the therapy dogs who worked at Ground Zero, the SDF's new National Training Center, and post-9/11 rescue missions at home and abroad. A special section, written by selected 9/11 handlers, pays tributes to their canine partners who passed away after their recovery missions. In addition to paying tribute to the dog-and-handler teams that were deployed after the attacks, this I-5 Press book supports the National Disaster Search Dog Foundation (SDF) in its mission to produce certified search and rescue teams to protect our whole nation. A portion of the proceeds of Dog Heroes of September 11th benefits the SDF.